The Andamans have a lot more to offer than just picture-perfect sunsets and beaches. Venture out into the sea and the mysteries of the sea will unfold before you. 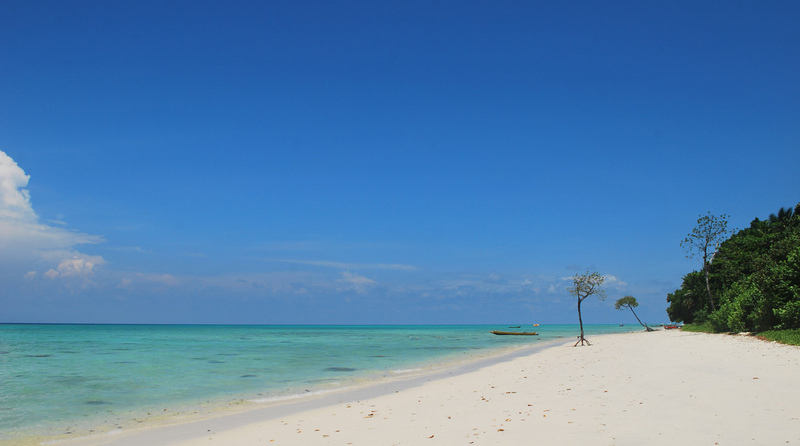 Wheather it be on the surface or underneath it, Andamans will steal your breath at every inch. 1) Go for a Sea Walk! Adventurers walk along the sea bed (6-7m depth) and wearing a special helmet with a transparent visor that allows breathing and looking to take place unhampered (the oxygen tank is on the pontoon). The experience includes getting photographed with the unperturbed fish, unique coral and delicate fauna. North Bay Island is located, as its name suggests, north of Port Blair – a 40-50 minutes jetty ride away (from Marina Park, Port Blair). North Bay offers both plenty of water sports for thrill seekers and places to simply relax for those looking to unwind. 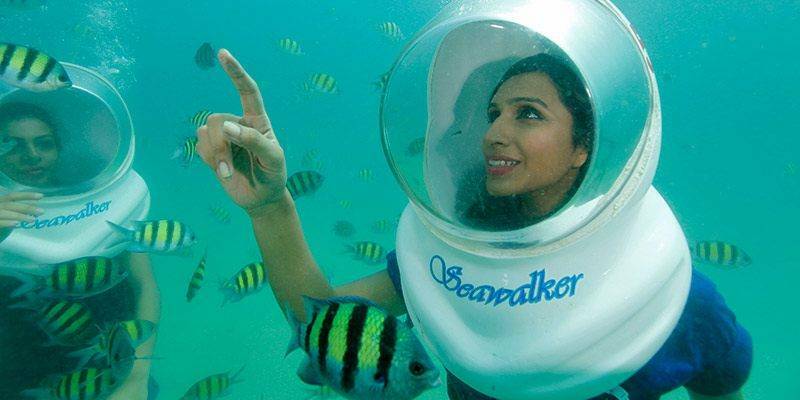 The Underwater Sea Walk at North Bay is one of the most sought after water activities around Port Blair. Another popular location for snorkeling is Elephant beach. Elephant beach is located on the North-eastern part of Havelock Island (one of the many islands that comprise of the island chain off Great Andaman). It’s a popular tourist destination known for its pristine sands, crystal waters, and sea waves. Accessible by boat and foot, it’s a short 10km from the market. A huge advantage of doing the underwater sea walk at Havelock is the island’s crystal waters that are facilitate the optimum experience. The sensation of the Underwater Sea Walk can be likened to that of walking on the moon – although, with a significantly better view. A certified guide and instructor accompanies all trips and to ensure safety of all those who are participating. The underwater sea walk can be done all year round although the spawning season (September to November) offers innumerable fish and coral teeming with biomass. Underwater sea walking is an ideal experience even for those with no swimming or scuba skills, but who want to see the world from a fish-point-of-view. Rev up the engine and throttle hard to ride over the waves. If you are a speed junkie then the open water of Andaman is there for you. 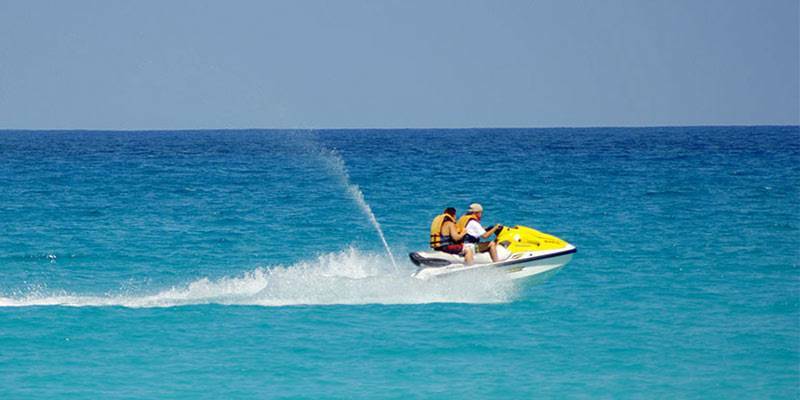 It will be hard for you to control the adrenaline when the Jet Ski tears through the waves. You will also get a photograph of you riding the beast to boast about. Live the moment which you watched with awe in all those movies. Surfing is both a sport and a culture at the Andamans. Little Andaman offers the best exposure, with Hut Bay being able to brag about being, and facilitating, one of the best surfing destination areas. Hut Bay is a pleasant town in Little Andaman – the entrance and exit point for the island. Only 120 km from Port Blair, government ferries run daily between Hut Bay and Phoenix Bay jetty (Port Blair). With a 22 km long shoreline, Hut Bay’s shoreline is the longest of the Andaman and Nicobar Islands. It stretches from Netaji Nagar on one side to Butler Bay shoreline on the other end – passing through Kalapathar. The south swells begin to pump in March but due to the monsoon that occurs May to August, the season for optimum surfing is restricted to two or three months. The region has barrelling waves and so is most appropriate for intermediate and advanced surfers. Havelock Island offers the best dive sites in the Andaman islands. Getting to Havelock Island from Port Blair can be done by frequent boats that ferry travelers to and fro. Elephant beach is located on the North-eastern part of Havelock island (one of the many islands that comprise of the island chain off Great Andaman). It’s a popular tourist destination known for its pristine sands, crystal waters, and sea waves. Accessible by boat and foot, it’s a short 10 km from the market. Scuba diving at Elephant beach presents the opportunity to swim among the varied aquatic life – from pipe fish and crabs to eagle rays. The colorful reef bursts with life as the many fish and juvenile shrimp busy themselves with their daily routine. The depth goes down to 12 m with snappers and barracuda habiting the deeper waters. Apart from Elephant beach, Havelock island offers many, many scuba diving sites. Each unique with respect to the sights it offers, difficulty level and depth reached. The most popular sites are The Wall (intermediate level, sights include critters, reef fish, hunting pelagic, schools of snappers), Seduction Point (famous for rocks with staghorn corals), Barracuda city (interaction with sea turtles can take place, intermediate level), Mac Point (all levels, swimming with dugongs can take place), Aquarium (beginner level, popular for the colourful schools of fishes) and Lighthouse (all levels, night diving). Neil Island is a small island (13.7 km²) in southern Andamans. Despite its small size, the island has an immense amount to offer divers of all experience levels. The most popular sites are Margherita’s Mischief (suitable for all level, calm and crystal waters, sights include Pufferfish, Dugongs, Blue-spotted stingrays, and Yellow Snappers), K Rock (perfect for all levels, a huge volcanic rock that is home to Butterflyfish, Sweetlips, Soldierfish, and Snappers), Bus Stop (suitable for all levels, has a sandy bottom with small reefs). Among others, Port Blair also has diving sites but they tend to be more crowded. Chidiya Tapu is another amazing dive site not far from Port Blair. Although dive sites in the Andamans are accessible all year long, January to May is when the seas are the calmest and visibility the highest. Diving during September to November is fantastic due to the biomass and spawning that occurs on the reef however, the winds are still strong enough to cause dives further out in the sea to get cancelled. 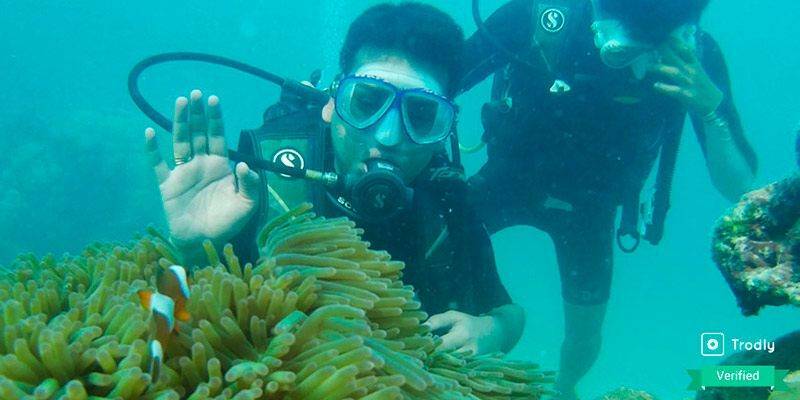 Scuba diving in the Andamans has something to offer for everyone! A postcard-worthy island, Jolly Buoy is just off the coast of Port Blair and accessible by boat from Wandoor beach dock. The white sand is comfortingly warm and the crystal waters wave invitingly. 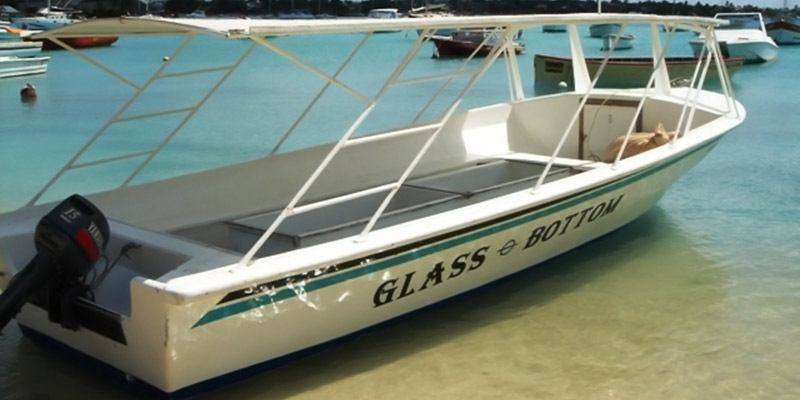 A glass bottom boat is used to get to the shore of Jolly Buoy. Jolly Buoy Island, and the neighboring Red Skin Island, is a part of the Mahatma Gandhi National Park and is therefore protected well – allowing the native species to thrive without much human interference – and making the surroundings even more beautiful. The glass bottom boat allows visitors to witness the wonder beneath their feet. Zebra fish darting through the multi-colored corals, some even witness schools of fish weaving through the coral and other aquatic flora. The Shore of Jolly Buoy Island is extremely clean – littered only with the dry, twisted trunks of trees. Fringed by a dense forest, the island is a strictly no plastic and no littering zone – enforced well by the authorities. Jolly Buoy Island is closed for six months from May to November. Given its protected status, a forest permit is required to visit along with the ticket. Valid photo ID must be carried for this. It is recommended that visitors carry their own food and drink as the island doesn’t have any such accommodations. The glass bottom boat ride is unique because of the vessel it takes place in and the spectacular views it offers – all without the inconveniences and requirements needed to physically go under the water’s surface! It’s ideal for all ages and highly recommended. 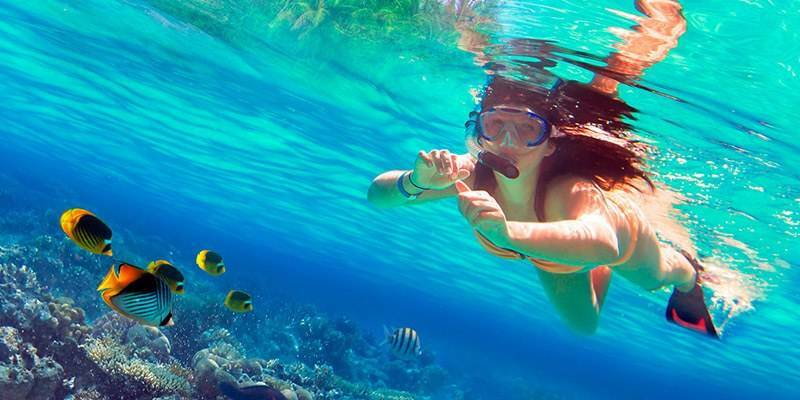 Snorkelling can be done by swimmers and non-swimmers and requires minimal equipment. It’s done mainly in the shallow waters where the vivid coral-structures and amazing marine life can be viewed. Havelock Island is the largest of the many islands that comprise the island chain off the eastern side of Great Andaman of the Andaman Islands. It’s an extremely popular tourist destination with picture perfect sceneries and thrilling activities. Havelock island offers many snorkeling spots (more than 50) that are inhabited by a myriad of aquatic species – from the Hog fish and Red Hind to the Leafy Sea Dragon Some popular snorkeling locations on the island are Aquarium (southwestern end) and Elephant beach (northeastern end). Many smaller islands around Havelock that are just a few minutes by boat are also famous and provide a variety of different experiences and sights. Port Blair also offers many locations for snorkeling – each one with slightly different features and inhabitants. Port Blair tends to be slightly more crowded than Havelock Island but a great experience nevertheless. North Bay in Port Blair, with its fringing coral reel, is known to be one of the best snorkeling sites in the Andamands. North Bay Island is located, as its name suggests, north of Port Blair – a 40-50 minute jetty ride away (from Marina Park, Port Blair). A ferry takes tourists across Aberdeen Jetty to North Bay, and back. The coral is spread over a large area with many an adventurous fish, lobster and clam coming to say hello. Snorkeling is an activity that can be enjoyed by all ages and almost all throughout the year – ideal for a relaxed vacation filled with the most colourful finned friends! 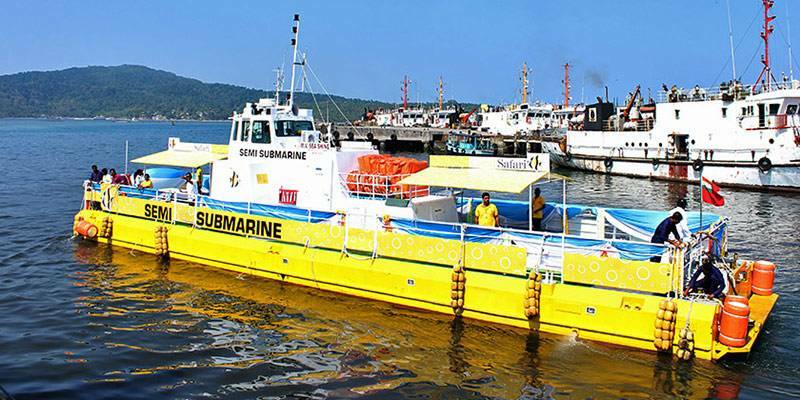 The Semi-submarine or Coral safari in Port Blair is a one of a kind experience – truly unique in all aspects. The entire experience is facilitated and possible due to the famous “semi-submarine” which is a boat with a 100-person capacity underwater cabin cordoned off with huge glass windows that are strategically placed at 45⁰ angles for the optimum view. The entire safari lasts approximately two hours and is perfect for individuals of all ages and situations – allowing those that can’t directly experience the magical marine life due to circumstances (e.g. age, disabilities) to get intimate with what lies below that shimmering blue water’s surface. Since the experience rests largely on water visibility, it is advised to take part in the coral safari in areas that have clearer waters, such as Havelock instead of Port Blair. There have also been complaints about the semi-submarines being in substandard conditions with the AC not working and the viewing glass being dirty and thus impacting the overall experience. The coral safari allows explorers to get up close and personal with the brightly coloured reef and its inhabitants while being in the comforts of the unique semi-submarine. It can be undertaken all year round, however the months of January to May offer crystal visibility while September to November is the spawning season and so the reefs are bustling with activity. Examples of fish that inhabit the area and are frequently caught are Black Marlin, Yellow fin Tuna, Dogtooth Tuna, Blue Marlin, Sailfish, and Dorado. 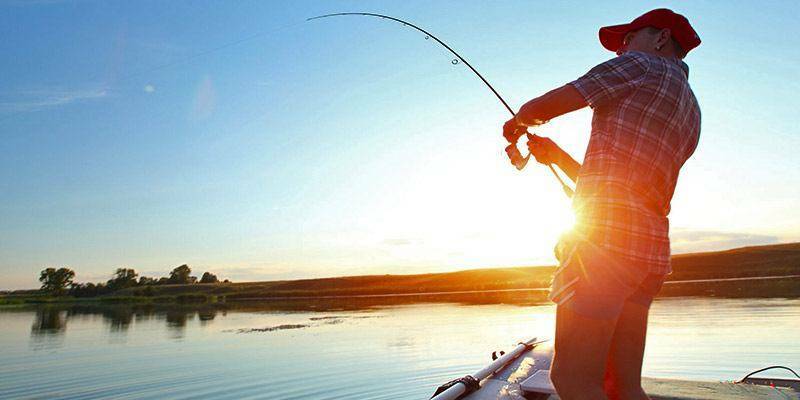 Most boats for hire are of various sizes and have equipment for trolling, popping and jigging. Impressively, the fishing community’s firm catch-and-release policy works and helps to ensure that future generations will have the opportunity to test themselves against the magnificent fishes. The most optimal months for game fishing in the Andaman Islands are February and March. Our peak season is from November until Mid April. The second week of May brings in the monsoon season. Havelock Island, like many other spots in the Andamans, is quickly becoming a popular kayaking destination. The most popular kayaking location in the Andaman Islands is Port Blair as it is the most commercialised area and therefore where most Kayak Tours tend to be located. Havelock island also does provide kayaking opportunities aplenty. November and December are the perfect months to grab paddles and a kayak and head out to the lush mangroves and the still backwaters surrounding the islands. 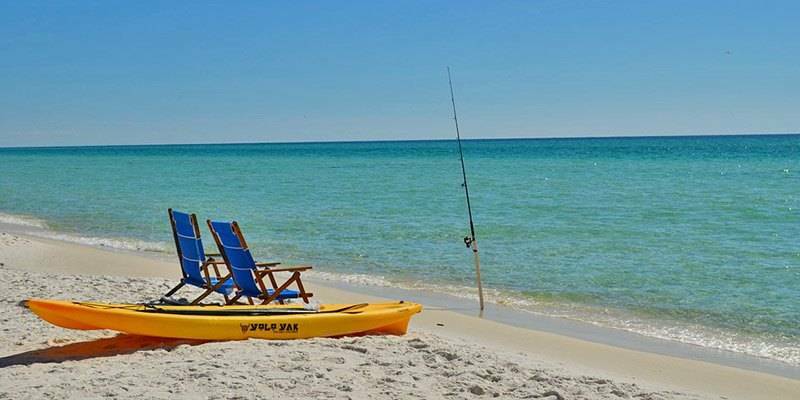 It’s the perfect way for non-swimmers to enjoy what the waters have to offer. Live-aboard scuba expeditions are when a group of divers and a supporting team of instructors, seamen, etc, live on a boat or another similar vessel for a period of a few days (usually 3-6 days). This becomes an “eat, sleep, dive” experience where dives happen multiple times a day, nights are spent sleeping in the middle of the ocean under a blanket of stars. 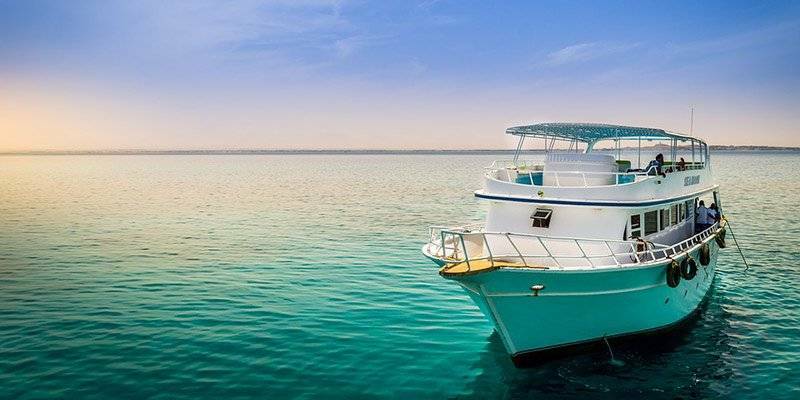 Staying on the dive boat also allows divers to travel to further and more remote dive sites that can’t be explored in day excursions due to time constrictions. This allows travellers to get the full potential of what the untouched islands and their waters have to offer. Most live-aboards to the Andaman islands depart and return from foreign ports in the vicinity (e.g. Phuket). Although diving can happen all year round in the Andamans, the ideal time to dive is during the months of January to April as the water temperature is pleasant and not uncomfortable, and the visibility is optimum.Live-aboard scuba expeditions are ideal for the enthusiastic diver who isn’t satisfied with the regular and craves a truly immersive experience. The Andaman islands offer reefs teeming with turtles, octopus, rays, and the occasional reef shark – a combination offered nowhere else in the world!